The trees were strung with festive lights and the streets thronged with shoppers. 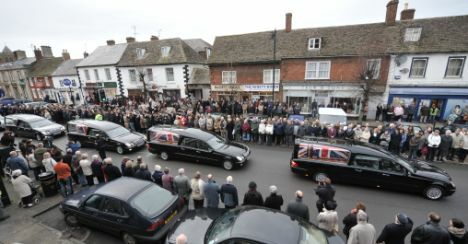 But Christmas was put on hold in Wootton Bassett today as five young men came home from war. 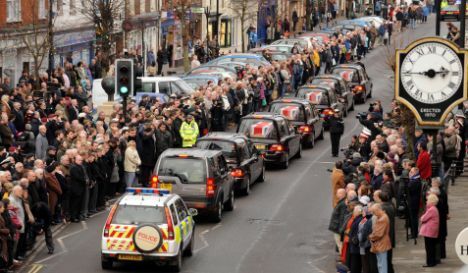 One thousand people stood silently on the streets to honour the soldiers killed in Afghanistan as their coffins, draped in Union Flags, were driven through the town after arriving at nearby RAF Lyneham. 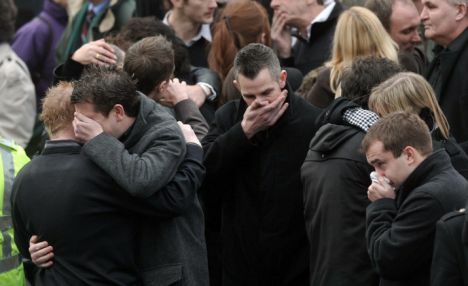 As those in the crowd clutched parcels and shopping bags, their thoughts were with the men’s families who will endure this Christmas in a haze of grief. And for ever more, the season of goodwill will be just another reminder of the loved ones lost. 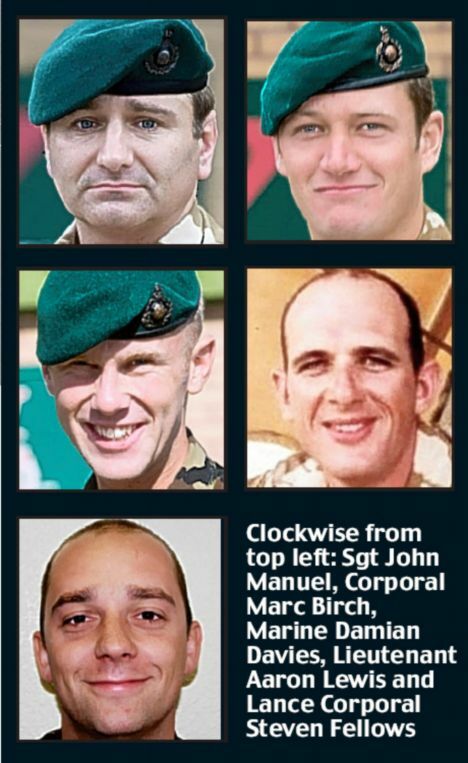 Today’s tribute honoured five commandos killed in Helmand province in the past week. Royal Marines Damian Davies, 27, Sgt John Manuel, 38, and Corporal Marc Birch, 26, were killed in an apparent suicide bomb attack by a 13-year-old Afghan boy last Friday, close to the town of Sangin. An hour earlier Marine Lance Corporal Steven Fellows, 28, was killed in a roadside bomb attack a few miles away. And on Monday, Lt Aaron Lewis, 26, a soldier from 29 Commando Regiment Royal Artillery, died near the town of Gereshk when the gun battery he was commanding came under enemy fire. 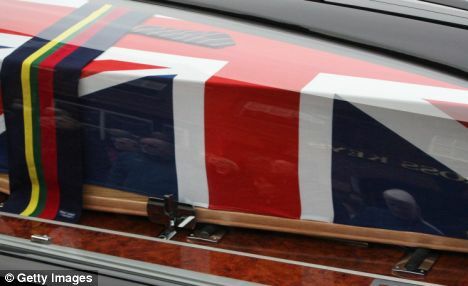 Earlier, the men’s families watched as the coffins were unloaded at RAF Lyneham, with full military honours. 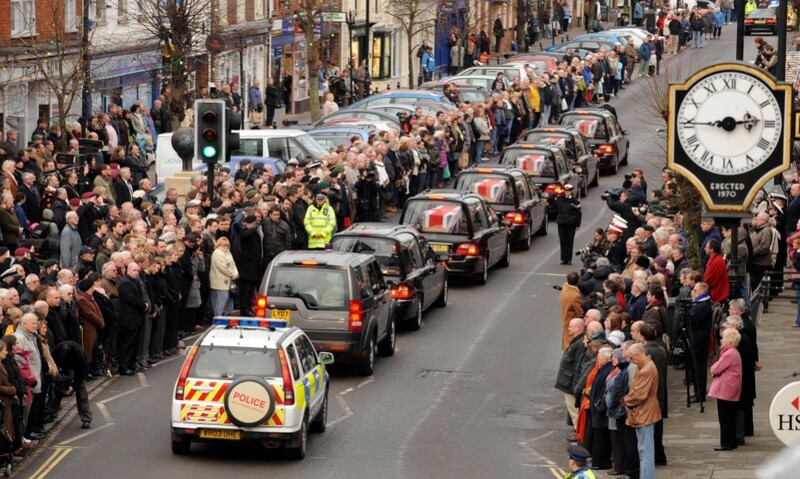 They were driven through Wootton Bassett in Wiltshire en route to the John Radcliffe Hospital in Oxford. The town came to a standstill, with shops closing and members of the public, including many veterans, standing in solemn silence. 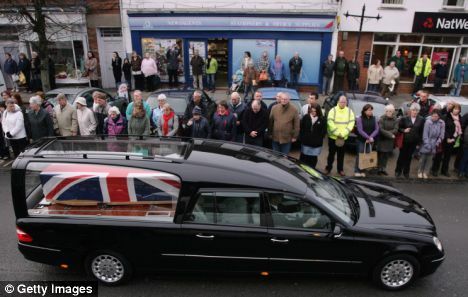 Many were in tears as the procession moved through, pausing for a minute’s silence at the town’s war memorial. This comes as a British officer has warned that it will be ‘business as usual’ over the Christmas period for troops in Afghanistan, where 13 UK personnel have been killed in Helmand Province since the beginning of October . Lieutenant Colonel Alan Richmond, commander officer of the 1st Battalion The Queen’s Dragoon Guards, currently operating around the town of Garmsir in southern Helmand, said: ‘We are all prepared for there to be no let up. ‘It doesn’t take that many people to mount the asymmetric threat, such as suicide bombings and improvised explosive devices. 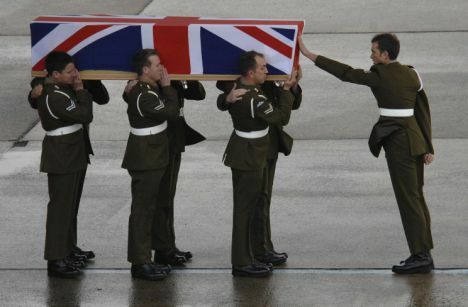 Military pallbearers carry the casket of Corporal Thomas James Hamilton at CFB Trenton in Trenton, Ont. 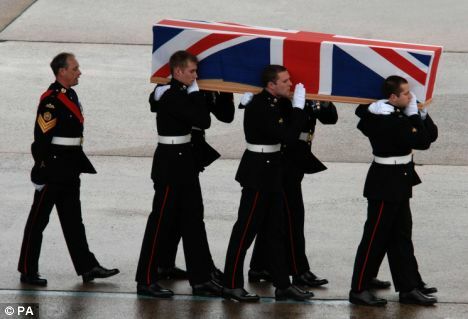 Military pallbearers carry the casket of Private John Michael Roy Curwin at CFB Trenton in Trenton, Ont. 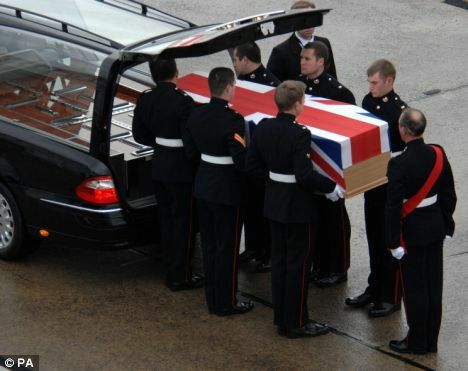 Military pallbearers carry the casket of Private Justin Peter Jones at CFB Trenton in Trenton, Ont. The bodies of three more Canadian soldiers slain in Afghanistan have been returned to Canadian soil. A military aircraft carrying Cpl. Thomas Hamilton, Pte. John Curwin and Pte. Justin Jones touched down at CFB Trenton at about noon on Tuesday. All three served with Golf Company, 2nd Battalion, RCR based in Gagetown, New Brunswick. A motorcade transported their caskets along the Highway of Heroes into Toronto for a standard post-mortem event. They arrived on the eastern outreaches of Scarborough around 3 p.m. ET. People greeted the motorcade with Canadian flags and yellow ribbons. Some stood silently, and other applauded as the motorcade passed. The OPP put out a news release Tuesday morning urging people not to pull over to the side of the 401 when they see the motorcade pass. “Cars parked on the shoulder and people standing on the side of the road are a hazard to traffic on the road and to those who have stopped,” it said. Instead, they want motorists to pull right off the highway. Having Canadians gather on the overpasses to show respect for returning fallen soldiers is a growing tradition — one last exercised about a week ago when three other soldiers died. Cpl. Mark Robert McLaren, Warrant Officer Robert John Wilson and Pte. Demetrios Diplaros, were from the 1st Battalion, Royal Canadian Regiment, based out of Petawawa, Ont. They died on Dec. 5. Their deaths brought Canada’s military death toll in Afghanistan to 100 since 2002. The toll is now 103. In both incidents, the soldiers died as a result of roadside bombs. On Tuesday morning in Afghanistan, Lt.-Gen. Michel Gauthier told reporters that two insurgents had been killed while trying to plant roadside bombs on the same stretch of highway that claimed the six Canadian lives.